***** I love checking out a new venue and when it is the location for 12 plays in one night by one of our favourite student companies all the better. Gardening in Small Spaces, written by Jack Hewitt, Dan Galvin, Paul Howe, Helena Langfield, Lana Pitcher, Danny Stones and Kathryn Norton, is a series of 12 vignettes all set in an apparently ordinary garden, performed by Jack Cadman, Charlotte Schofield, Lucy Bytheway, George Shipton, Eleanor Wright, Kate Alhadeff, Jake Bastable and Kate Phillips. The 12 short plays are structured around the cycle of the four seasons, with each being self-contained and unconnected to the others, including monologues, comedies, dramas, a musical and a dance. Wonderfully written and performed throughout, with not a weak piece amongst the dozen, Gardening in Small Spaces provided an excellent showcase for all involved and should be seen by anyone who can help move them forward in their professional performing careers as well as all who want to witness the superb talent, skill and range of some of Sheffield’s very best up and coming writers, actors and dancers. I must especially praise the writing of Jack Hewitt, whose words brought to life genuine human characters, with respect, honesty, truth and natural passion, comedy and chemistry, with The Stork, as an expectant mother myself, especially capturing the chemistry between potentially expecting parents and the comedy and emotion of waiting to discover if you are expecting and the baby naming debate. Jack also provided for me the best play of the night in the passionate, almost Fleabag-like monologue The Magpie, which both in its writing and performance Phoebe Waller-Bridge would be proud of and that will never leave you thinking about park benches or your liver in the same way again. Others of the 12 plays that I truly loved were The Panel by Helena Langfield presenting a hilarious parody of BBC gardening programmes that had the entire audience in stitches throughout and would not have been out of place on Not The 9 O’ Clock News; Danny Stone’s The Rook, which provided the other outstanding monologue of the night with the actor truly bringing the attitude, spirit and body language of the Ray Winston, East End gangster like bird to life and even as someone with a phobia of birds gave me an entirely new insight into the feathered creatures; and Kathryn Norton’s The Statue, which was hauntingly classic yet harrowingly contemporary as a candlelit adult fairytale, that I can see easily and successfully being extended into a novel or full length production of its own. 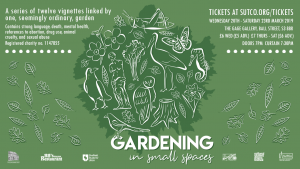 Gardening in Small Spaces will be performed at The Gage Gallery until Saturday 23 March at 7.30pm. Tickets are £6 in advance and £7 on the door. To book visit www.sutco.org/tickets. The award winning SUTCo perform four shows a semester. Their final show of this semester is Anatomy of Gray from 1 to 4 May at Sheffield University Drama Studio. For further information and to book visit www.sutco.org. Please note that this production includes strong language, death, mental health, references to abortion, drug use, animal cruelty and sexual abuse. P.S. I recommend arriving at this performance early to get a seat near the front to get the best view of the performances and bringing a coat or jumper with you as the venue has not been affected by the warm March weather.